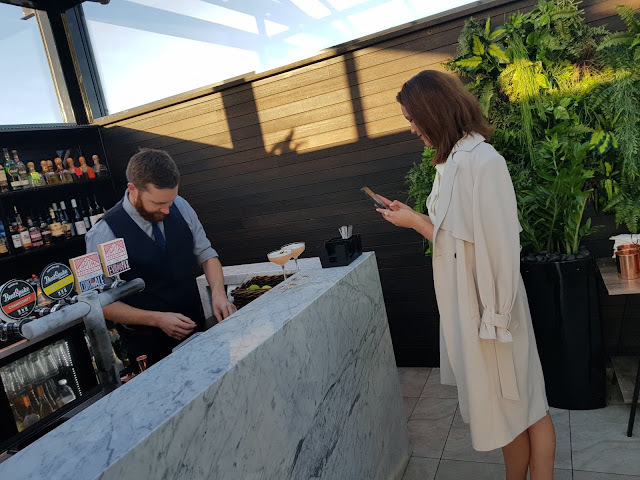 The influencer daughter was invited by Her Canberra and Agency 9 to take a personal tour and sneak peek of the new Howling Moon rooftop bar at the Rex Hotel in Canberra yesterday and ... you guessed it ... I went along as her "plus one". 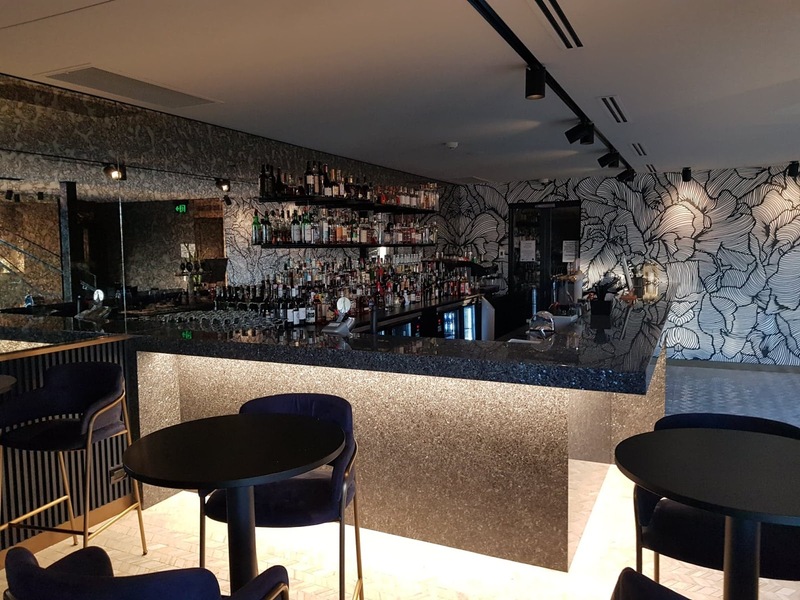 Located on level 6 of the Rex Hotel 150 Northbourne Avenue, Howling Moon has 180 degree views towards Black Mountain to the front, the Brindabellas to the left and the length of Northbourne Avenue to the right as you watch the traffic coming into the city via Canberra's gateway. Look up to the sky through the glass ceiling or down to the road with a bird's eye view of our light rail construction. Howling Moon has actually been around for about 6 months which has meant they've had plenty of time to perfect their cocktails and create a fabulous vibe. We visited in advance of their official launch party next week. 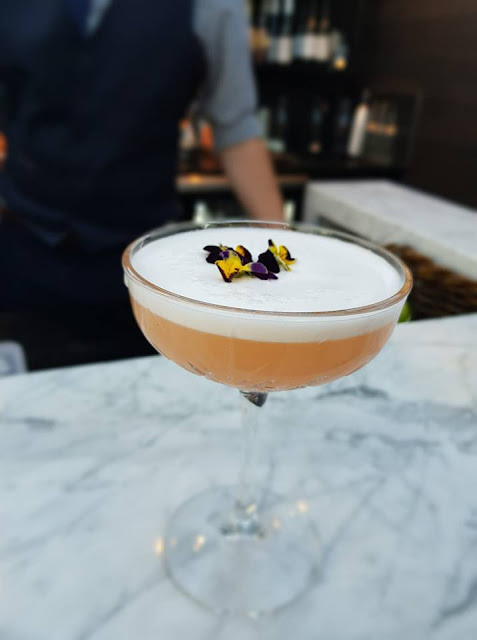 Trying the Her Canberra signature cocktail in advance of opening night - the "Her Right Honourable"
Howling Moon isn't the only spot to sip a drink at the Rex. 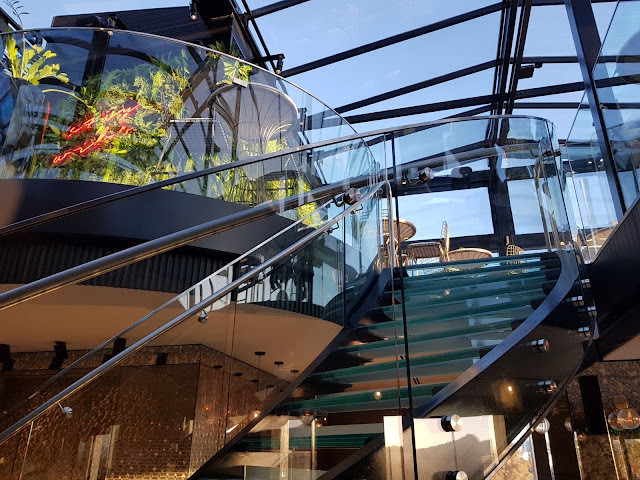 Wander down the gorgeous glass staircase and you'll find the Swan and King luxury cocktail lounge. 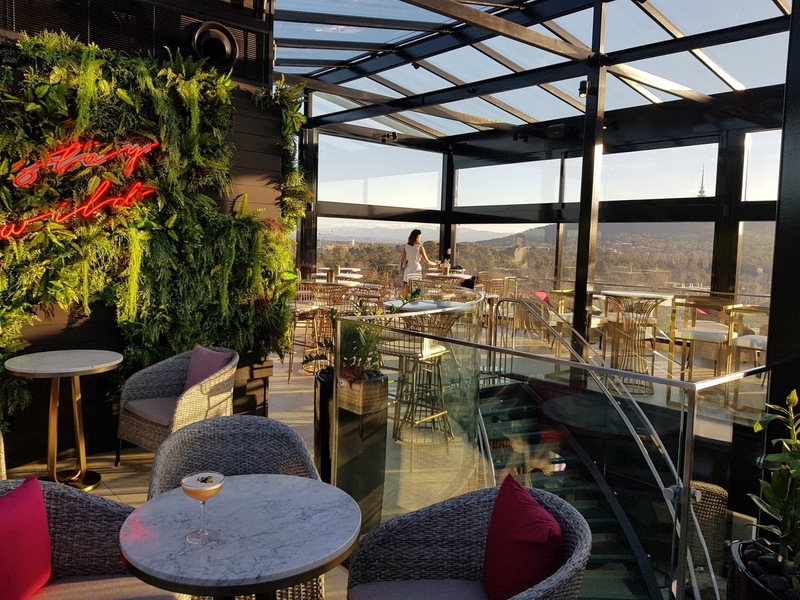 Where Howling Moon offers light, colour and panoramic views protected by glass, the Swan and King gives you a darker more intimate feel. 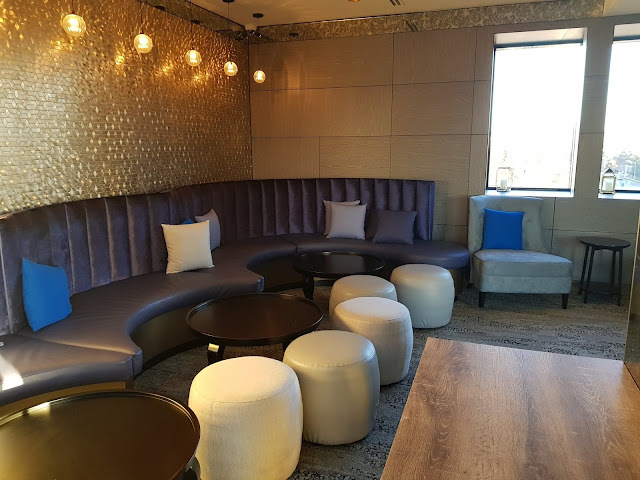 Candles line the window sills, with big leather couches, ottomans, dark wood tables and every drink imaginable available at the bar. An open-air balcony allows the panorama to continue. The Canberra Rex opened back in 1959 and at the time it was considered to be the place to be for Canberra's VIPs. Time has aged it and for many years it's been overshadowed by newer shinier hotels. 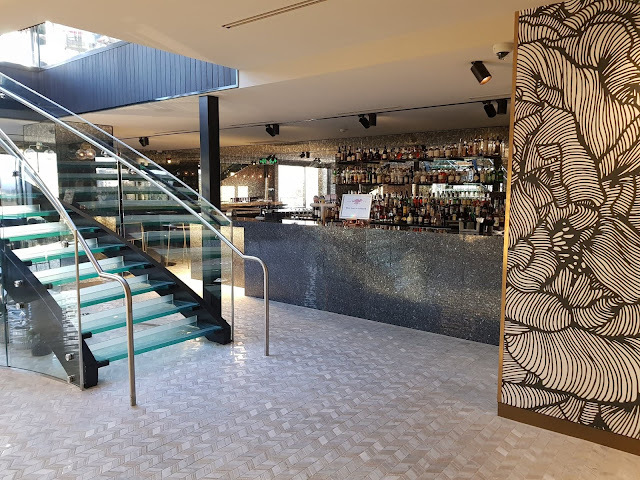 But a recent multi-million dollar makeover has given it back its luster and the Rex is quickly claiming back its title as the jewel in Canberra's crown. Howling Moon and Swan and King are a big part of that rebirth. So while our girl misses the official party due to travel next week, it was lovely that she was invited to experience the venue(s) and a few cocktails ahead of the launch. I was honoured to be her "plus one". Do you remember the Rex Hotel? When was the last time you were somebody's "plus one"? Which bar are you more attracted to? Howling Moon or Swan and King? Her Right Honourable looks delicious and refreshing! Lucky you being your Influencer Daughter's plus one! Me too! LOL. Remember when it was the interstate bus terminal? Ooohh, I'm a bit high maintenance so it's Swan and King for me! Fab mother and daughter night out! I remember the Rex. It has been there since I was a kid I think! Yep. Been around for as long as I can remember. That opening photo is pretty tip top! Hope to make it there! Definitely my fave pic of the evening. Absolutely. I'll meet you up there! ACT is the only state I have not been too. Looks like I need to visit!! It looks stunning - what a great vista and gorgeous inside. I can't believe you haven't featured Miss T in more pics as you have a model on-hand though perhaps her agency wanted others! I know. I'd love to show more pics. I try to give her her space. Ohhhh...I think I need to be a "plus one"....what a fabulous place!! I think you do quite well on your own Jodie. Hey, maybe one day I can be your plus one! What a funky looking place. 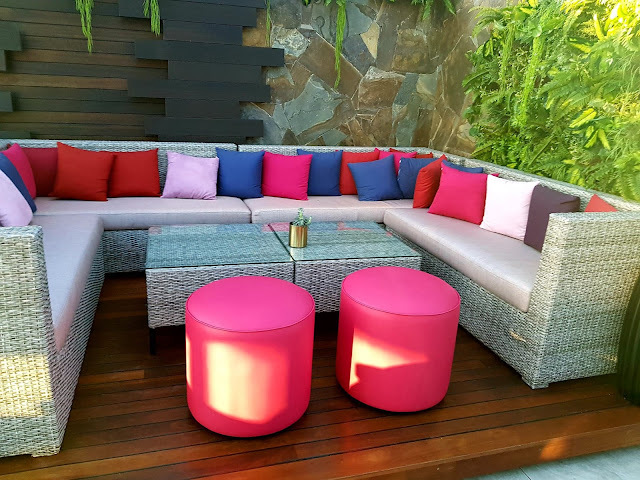 It's hard to gather an atmosphere but from all your pictures, looks like the place to be. I'd love to see it in full swing. Hard to determine the vibe when it was just us. We did feel very special though. 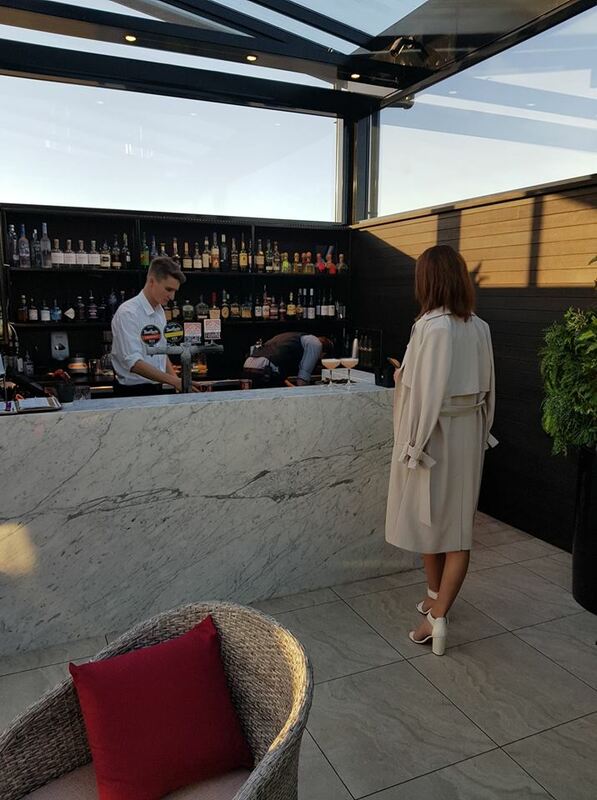 I enjoy having a cocktail at a rooftop bar. There's something about being up high overlooking the bustling city streets or otherwise pretty scenery. I think the Howling Moon would be a great place for a drink. I agree. Being up high and looking down at the stuff that consumes us in everyday life helps put things in perspective. Is what I meant to type. What a super place to chill. Very cool. 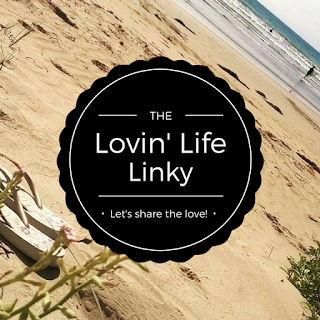 Thanks for hosting and I hope that you have a wonderful weekend. Sorry I am so late. Let me know when you're here. I'll show you around.